Bucas Grande island is also known by the name Socorro. It’s a one of a kind island, with many small islands and islets which are very densely vegetated. It is home to many breathtaking wonders, such as hidden lagoons, caves, and strange animals like schools of stingless jellyfish you can swim around. Socorro is a perfect destination for a daytrip and even for a longer stay, depending on your location, time and preferences. It is ideal for romantic vacations, and also for small groups. 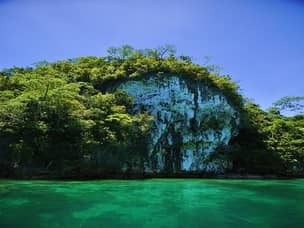 It is easily one of the most beautiful places in the Philippines, and should be on the must-see-list of anyone who travels to Surigao Province area. How to get to Bucas Grande? Surigao is the main gateway for Bucas Grande. There are many daily flight to Surigao from Manila and Cebu, and even a night ferry from Cebu city. From Surigao City you can ride a boat from port 1, to Socorro Town on Bucas Grande. It will take about two hours, and it leave Monday to Saturday between 11:00-12:00am. Another route is to take the boat from Hayanggabon Port. It is only a short trip (roughly 1 hour). To get to Hayanggabon from Surigao, go to Surigao’s central bus station and take a bus/jeepney to Hayanggabon port, in Claver Municipality south of Surigao. It is around 1 hour, so the whole trip is about the same time (2 hours) as going straight from Surigao by boat. However, the boat form Hayanggabon leaves every day including Sundays, and there are boats that will take you directly to Sohoton, and therefore is better for a day trip. The boats leave around 11:00am and 3:00pm, so make sure to be there ahead of time. If you happen to be on Siargao Islnad you can take a boat from Dapa (or a private boat from General Luna). From Dapa there are two boats, the 7:30am one, and the 2:30pm one (1 hour). There are few accommodation options on this island. The cheaper ones are going to be in Socorro town, but it is best to stay in one of the island’s private beach resorts. Many of them are located in small hidden coves, and when in this exotic destination, they make a perfect place for you to stay and enjoy Bucas Grande to the fullest. Our list presents you with a variety of these resorts, so just choose the one you like after reading the reviews, or contact us for an expert’s opinion. Location : Siargao Island, Surigao del Norte province. Flights : Closest airports are in Surigao City and Siargao Island. Boat : There are ferries from Surigao city, Hayanggabon Port, and Dapa in Siargao. Getting around: Getting around Bucas Grande is done mainly by small boats. Best time to visit : March to November is the dry season and the best time to visit. Attractions : Nature, lagoons, caves, Sohoton cove, stingless jellyfish. Extra tips : Renting a private boat is the most convenient and flexible way to reach and explore Bucas Grande; it’s better to bring cash and not rely on credit cards and ATMs. What to do in Bucas Grande? In this section we’ll present the attractions waiting for you. Choose your preferred activities, and we’ll build your itinerary accordingly. Based on your selected items, we’ll advise whether a day tour is enough, or a longer stay is needed. When you enter through the small hole appearing only during low tide, you feel like sailing into a realm of magic. It’s a natural maze of islets inside, scattered in the crystal clear water. You might also see giant fruit bats flying above, or some stingless jellyfish floating around. Sohoton Cove is only accessible during low tide, when an entrance appear below the tall cliffs. When visiting you have to register in the tourist center and be accompanied by an experienced local guide. While you explore around, the guides will take you caving in Magkokoob. You’ll climb and crawl inside, reaching the exit point to jump from a 5m high platform back into the water. Another stop in Sohoton is Hagukan Cave that you must swim into, and see it glowing in a mysterious way. The trip to Sohoton takes 2 hours, as you must leave the same way you entered, while it’s still low tide. The jellyfish sanctuary is as special as Sohoton. The critters scientific name is Mastigias Papua, but a more colloquial term is the Spotted Jelly, Lagoon Jelly, or Golden Medusa. Their color range from red to brown, with white being less common. The jellyfish don’t sting and feed on plankton. They live around Bucas Grande all year, but the best time to see them is between March and June, when they’re in great number. In the sanctuary you will be guided by small paddle boats. Motorized boats aren’t allowed in the calm cove where the Jellyfish live as it harms their population. You’ll sail around thousands of these creatures, and can even touch and hold them for a very short period of time. Be sure to listen to your guides orders so you won’t hurt them. Swimming around Tojomon Cove is prohibited, as these are sensitive creatures and protected in this area. If you want to swim around these animals you will get the chance to do so responsibly. Tojomon is the place where they’re mostly grouped, but you will encounter them in other places while snorkeling Bucas Grande. Just make sure to be responsible, don’t wear sunscreen while swimming with them as it is harmful to them, and don’t harass them. On top of the caves in Sohoton, there are also the Crystal, Bolitas, and Tundan caves. Crystal and Tundan are both open ended caves and a relatively easy trek. Crystal Cave earned its name because many of its chambers and formations are glowing when being lighted upon, as they are spotted with crystals. The Tundan Cave experience is a bit more challenging because you’ll have to crawl upon entering it. Bolitas Cave on the other end is close ended and challenging. Its chamber is small and the passage can only fit one person at a time. You’ll have to squeeze in, climb and glide here, so expect a really good spelunking experience. Tiktikan Lake is a short hiking distance from Bolitas, and if you are around it is definitely worth a visit. The lake is tranquil and surrounded by forested cliffs. You can paddle around, while enjoying the view, and there are also some huts where you can rest, or even spend the night at. Island hopping in Bucas Grande is different than the standard in the Philippines. The islands around are small, and the beaches are secluded and hidden. It’s common to spice the island hopping tour with some adventure. You can combine it with Magkahuyog and Kanlanuk Waterfalls. Magkahuyog is a seaside waterfall that you’ll see even before getting off the boat. You can alternate between bathing in salt or fresh waters, and gazing at the fall from the ocean. The second fall is a 3km trek from Kanlanuk Bay. When you’ll reach the falls, you could climb and jump from the top of it to the pool below, or just relax in the water. Those who wish to get a great panoramic view of Bucas Grande in a fun way, should head to Kapihan Nature and Adventure Park. There are several types of zip lines you can ride while watching the view. How does Bucas Grande fit into my travel plan? A visit to this magical place is suitable for people who plan to make a trip to Siargao or Dinagat, including it in your itinerary is a very good plan. We can either build a Bucas Grande tour package for you, or a full Surigao del Norte package if you like. If you’re still feel puzzled, just contact us, and our experts will take care of you. Hi. I was just wondering if a half day tour will be enough in Bucas Grande. Our flight arrival is at 11am in Sayak Airport Siargao. We are planning to go there in the afternoon and we’ll be back in Siargao after the tour since we’ll be staying in General Luna, Siargao. Do you think it would fit our sched? Hope you can help. Thank you. First of all congrats on choosing to visit a wonderful place most tourist ignore. You made a great choice and i’m sure you’ll have a great time. Your specific request is possible, but it will be a bit of a stressed itinerary. You’ll need to book a private boat going out of Dapa and it will of course result in increased costs. If there’s any way you guys can take the tour the following morning instead, it will be a much better choice in my opinion. In any case, i also mailed you some info to hopefully help you decide what’s the best course of action. We’ll be happy to assist and help book the tour for you if needed. We will be in Siargao from 12-16, March and is planning to visit Bucas Grande. Please assist to quote a 1Day tour for 4pax, date is 13-Mar-2018. Will send you a mail today, thanks! Hello, my wife and I will be in General Luna Feb 26 to March 1. We’re planning to do Bucas Grande tour on the 27. How much can we see in 1 day? We’re not really into hiking or any strenuous activities. Would you be able to help us book a tour and give us a quote on how much it’ll cost us? Would it also be possible to do this tour just us two? Thank you in advance and hope to hear from you. Yeah private tours going out of Siargao are available, but obviously they cost more. We’ll mail you a quote for both private and group tours. Should be able to do all in 1 day if you wake up early. hi. my partner and I are going to siargao on sept 3-8. we plan to include bucas grande in our iterinary. i do understand that a tour for two people will cost a lot so joining a group is the best option. can you help us in setting up with other groups so that we can lessen our expenses? thank you. Hi Mhel and thank you for expressing an interest in our tours. Since this is 7 months from now, we are not yet sure of availability for group tours to Bucas Grande. We have your email address and will contact you whenever we have more info regarding your request. One of our guys will mail you today, no problem. We will check if there’s an available group you guys can join next week. You can expect a mail from us on Monday. Hi, how much it cost per person for a 3days 2 nights package tour with sohoton and siargao? with all in transpo from butuan airport and to butuan airport? Hi Mayette and thanks for your inquiry. We don’t do transports from Butuan, only from Siargao or Surigao. If that can work, please fill in the inquiry form here and we’ll get back to ASAP. Hi Larrie and thanks for leaving a comment. You can expect an email from us very soon – it will include all the information you have required. Sure we have mailed you some suggestions. Hi! We are 4 or 5 person who like to visit Bucs Grande in February for 2 days. My daughter is disabled and sits in a wheelchair. She has only one functional hand. Is it a good idea to visit Bucas Grande with her, and what things would you suggest she can do with us, or which are the things she can’t do? PS: i can carry her for a short distance (10m) coz she is a lightweight. Hi Sam and thanks for the comment. Would you mind filling our inquiry form and leaving your phone number so we can speak? We never tried this tour with people with special needs. I don’t want to say she can’t do it, because she deserves to enjoy everything a normal child would. But intuitively i feel like Bucas Grande might not be the best choice since this tour is quite demanding. It’s better if we discuss this over the phone / skype so i can understand your plan better. If you have set dates already then i can also check availability for our speedboat and that will make the whole tour much more comfortable. Alternatively, we can also consider some tours in Siargao instead, which is just nearby Bucas and over there i feel much more confident we can take good care of you and your family. I look forward to hearing from you soon. Good luck with your travels and best of health to you and your family.